A good exemplar of infrastructural geography can be seen in the major Victorian engineering efforts to secure clean drinking water for the people of Manchester. This involved developing a large-scale system of reservoirs along the valley of the Etherow River to gather and store the plentiful rain water falling on the Peak District hills. Known as the Longdendale supply system, it became fully operational in 1877 and was able to deliver over 17 million gallons of clean drinking water per day to the city through a ten mile long aqueduct using only the force of gravity. It was widely celebrated at the time as a truely pioneering piece of engineering and one that brought real public health benefits to the residents of Manchester. 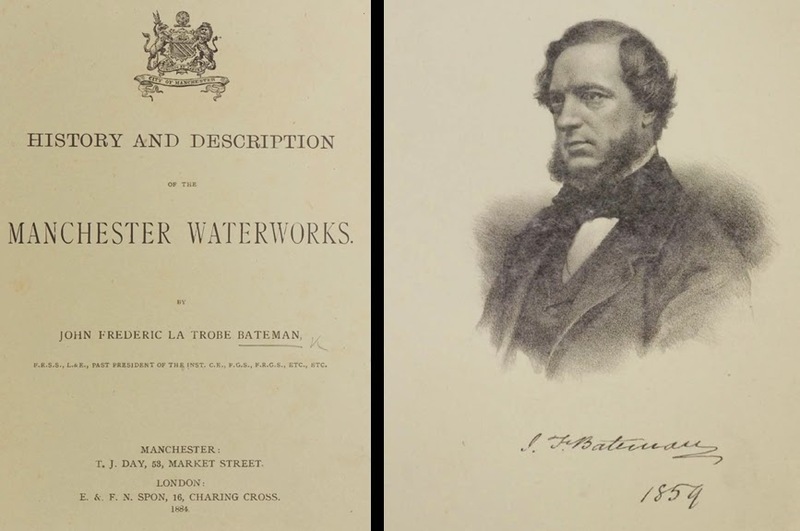 A detailed narration of the Longdendale project, which commenced in 1846 and took several decades to complete, was provided in a book length treatise, the History and Description of the Manchester Waterworks, written by the lead engineer responsible for its design and execution, John Frederick Bateman. His book was published in 1884 and it was a weighty tone packed with factual details and accompanied by over fifty plates. The whole book, including all the maps and plans has now been digitised through the expertise of the Centre for Heritage Imaging and Collection Care in the University of Manchester Library and is freely available to browse online. (If you want to own a print copy of Bateman's original book, they are available on the secondhand market but they're not cheap to buy.) While the book is somewhat autobiography, and unsurprisingly tends to privilege Bateman's role in the work, it does seem in many respects to be reliable account of the emergence of this infrastructural system. "Longitudinal section of puddle trench for the second embankment shewing the geological strata", from the History and Description of the Manchester Waterworks. The History and Description of the Manchester Waterworks runs to 224 pages and has over 50 large and well crafted illustrations including a range of overview maps, detailed engineering schematics, cross sectional diagrams and statistical charts. 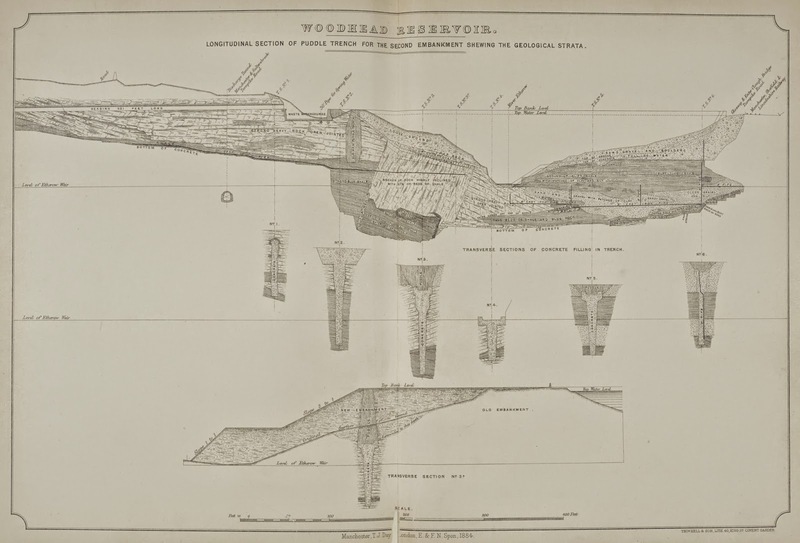 One of my favourite illustrations is this finely proportioned fold-out map that delineates the sizes and sinuous shapes of the five main reservoirs along the chain, from running in sequence from Bottoms upto Woodhead, plus the smaller reservoirs in side valleys and the various anciliary facilities, connections and conduits. Following on from the development of the supply system in the Longdendale valley, the growing demand from city and surrounding towns meant Manchester's infrastructural imperatives looked even further north in the 1870s to the abundant water available in the Lake District. 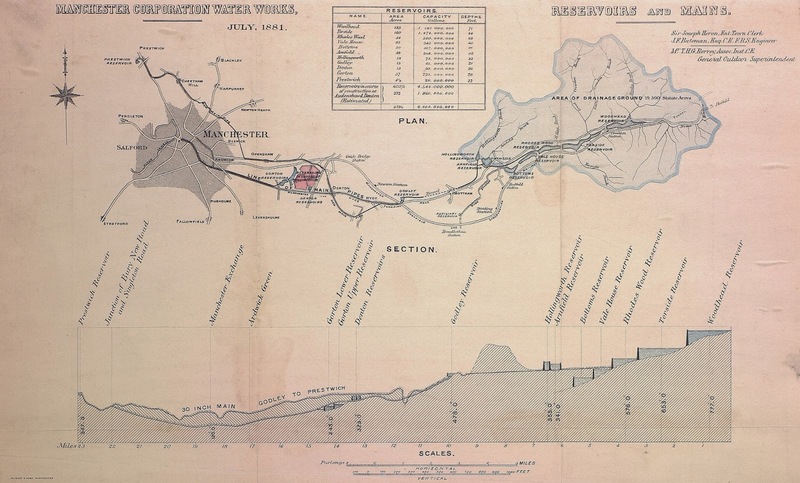 Manchester next water supply scheme was to tranform the Thirlmere Lake into a huge storage reservoir and to build a 96 mile long gravity feed aqueduct.